Osteomyelitis is a bone infection usually caused by bacteria, including mycobacteria, but sometimes caused by fungi. Osteomyelitis occurs most commonly in young children and in older people, but all age groups are at risk. Osteomyelitis is also more likely to occur in people with serious medical conditions. When a bone becomes infected, the soft, inner part (bone marrow) often swells. As the swollen tissue presses against the rigid outer wall of the bone, the blood vessels in the bone marrow may become compressed, which reduces or cuts off the blood supply to the bone. Without an adequate blood supply, parts of the bone may die. The infection can also spread outward from the bone to form collections of pus (abscesses) in adjacent soft tissues, such as the muscle. 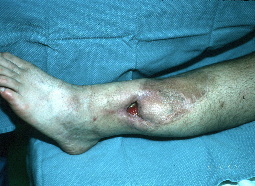 infections in adjacent bone or soft tissues. Osteomyelitis usually occurs in the ends of leg and arm bones in children and in the spine (vertebrae) in adults, particularly in older people. Infections of the leg and arm bones and those of the vertebrae are usually acquired through the bloodstream. Infections of the vertebrae are referred to as vertebral osteomyelitis. People who undergo kidney dialysis and those who inject illegal drugs are particularly susceptible to vertebral osteomyelitis. Bacteria or fungal spores may infect the bone directly through open fractures, during bone surgery, or from contaminated objects that pierce the bone. Staphylococcus aureus is the bacteria most commonly responsible. Mycobacterium tuberculosis (one of the bacteria that cause tuberculosis) can infect the vertebrae to cause osteomyelitis - Pott's disease. Any artificial device in the body may serve as a focus for infection. Osteomyelitis may also result from an infection in an adjacent soft tissue; the infection spreads to the bone after several days or weeks. This type of spread is particularly likely to occur in older people. Such an infection may start in an area damaged by an injury, radiation therapy, or cancer, or in a skin ulcer (particularly a foot ulcer) caused by poor circulation or diabetes. A sinus, gum, or tooth infection may spread to the skull. Infections of the leg and arm bones cause fever and, sometimes days later, pain in the infected bone. The area over the bone may be sore, warm, and swollen, and movement may be painful. The person may lose weight and feel tired. Infections of the vertebrae usually develop gradually, producing persistent back pain and tenderness when touched. Pain worsens with movement and is not relieved by resting, applying heat, or taking analgesics. Fever, usually the most obvious sign of an infection, is often absent. When osteomyelitis results from infections in adjacent soft tissues or direct invasion by an organism, the area over the bone swells and becomes painful; abscesses may form in the surrounding tissue. These infections may not cause fever, and blood test results may be normal. Infection around an infected artificial joint or limb typically causes persistent pain in that area. Chronic osteomyelitis may develop if osteomyelitis is not treated successfully. It is a persistent infection that is very difficult to eradicate. Sometimes, chronic osteomyelitis is undetectable for a long time, producing no symptoms for months or years. More commonly, chronic osteomyelitis causes bone pain, recurring infections in the soft tissue over the bone, and constant or intermittent drainage of pus through the skin. This drainage occurs when a passage (sinus tract) forms from the infected bone to the skin surface and pus drains through the sinus tract. Symptoms and findings during a physical examination may suggest osteomyelitis. For example, doctors may suspect osteomyelitis in a person who has persistent bone pain with or without a fever and feels tired much of the time. 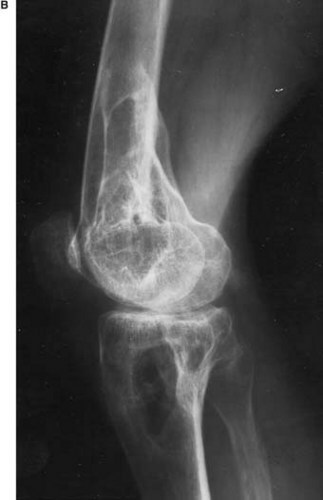 An x-ray may show changes suspicious of osteomyelitis. However, the abnormal area may not be detected on an x-ray until more than 3 weeks after the first symptoms occur. The infected area almost always appears abnormal on bone scans, except in infants, because scans do not reliably indicate abnormalities in growing bones. Computed tomography (CT) and magnetic resonance imaging (MRI) can also identify the infected area. However, these tests cannot always distinguish infections from other bone disorders. To diagnose a bone infection and identify the organisms causing it, doctors may take samples of blood, pus, joint fluid, or the bone itself to test. Usually, for vertebral osteomyelitis, samples of bone tissue are removed with a needle or during surgery. People who have artificial joints or metal components attached to a bone should take preventive antibiotics before surgery, including dental surgery, because these people have an increased risk of infection from bacteria normally found in the mouth and other parts of the body. The prognosis for people with osteomyelitis is usually good with early and proper treatment. However, sometimes, chronic osteomyelitis develops, and a bone abscess may recur weeks to months or even years later. For children and adults who have recently developed bone infections through the bloodstream, antibiotics are the most effective treatment. If the bacteria causing the infection cannot be identified, then antibiotics that are effective against Staphylococcus aureus or, in some cases, broad-spectrum antibiotics are used. Depending on the severity of the infection, antibiotics may be given intravenously at first, but they may be given by mouth later during a 4-week to 6-week course of treatment. Some people need months of antibiotic treatment. If a fungal infection is identified or suspected, antifungal drugs are required for several months. If the infection is detected at an early stage, surgery is usually not necessary. 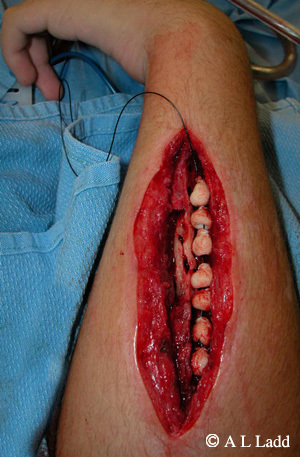 Occasionally, however, an abscess forms, which may be drained surgically. For adults who have bacterial osteomyelitis of the vertebrae, the usual treatment is antibiotics for 6 to 8 weeks. Sometimes bed rest is needed, and the person may need to wear a brace. Surgery may be needed to drain abscesses or to stabilize affected vertebrae (to prevent the vertebrae from collapsing and thereby damaging nearby nerves or blood vessels). When osteomyelitis results from an adjacent soft tissue infection (such as in a foot ulcer caused by poor circulation or diabetes), treatment is more complex. Usually, all the dead tissue and bone are removed surgically, and the resulting empty space is packed with healthy bone, muscle, or skin. Then the infection is treated with antibiotics. Usually, an artificial joint that has an infection around it is removed and replaced. Antibiotics may be given several weeks before surgery to try to eradicate the infection, so that the contaminated artificial joint can be removed and a new one can be implanted at the same time. Rarely, treatment is not successful and the infection continues, requiring surgery to fuse the joint or amputate the limb.